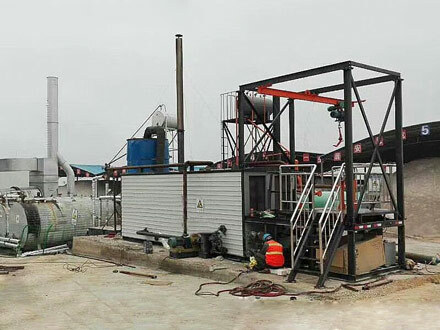 ZOOMLINE company develop new type drummed bitumen melting machine for heat thermal oil and exhaust gas as the heating medium; Piping design with advanced technology to meet the energy required to melt bitumen barrel, to realize sustained melting bitumen; and with the automatic dehydration and slag functions. 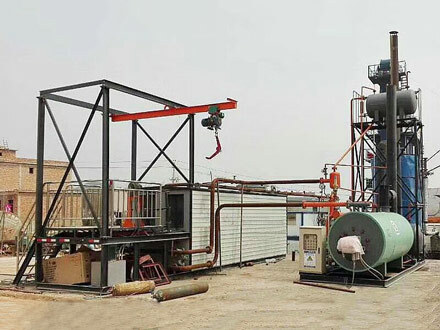 ZAM-Drummed bitumen melting machine mainly used for barrel bitumen melting, thermal oil as the medium, supporting the use of thermal oil heating machine. The device has convey barrel, dumping, storage, heating up, slagging etc functions, it is the necessary machine for highway construction organization. ZAM series drummed bitumen melting machine is consist of melting tank, sliding supporting platform, thermal oil furnace heating system and electrical apparatus control system. The bitumen melting tank is divided into two chambers. 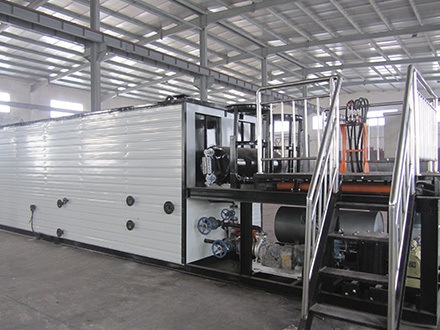 The upper one is melting chamber for barreled bitumen; the lower one is equipped with heating coil, and the heating coil exchange heat with bitumen barrel in radiation way to achieve the purpose of bitumen melting. The lower chamber keeps up heating to bitumen to reach the temperature of suction pump(100℃),then the bitumen pump pumps the bitumen into high-temperature tank, if increasing the heating time, you can get higher temperature. 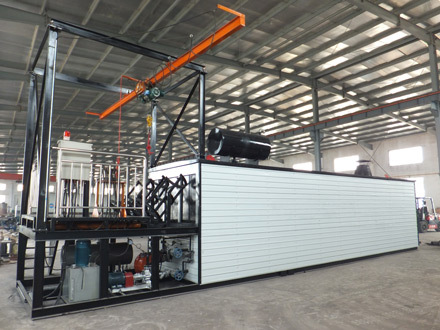 Lifting mechanism adopts cantilever structure, lift the bitumen barrels by electric hoist, traversing the bitumen barrel on the rail, then push the barrel into the upper chamber by hydraulic pusher, at the same time, push-out an empty barrel at the end of outlet. Bitumenbarrel inlet platform equipped with oil groove, to prevent dripping asphalt outflow.